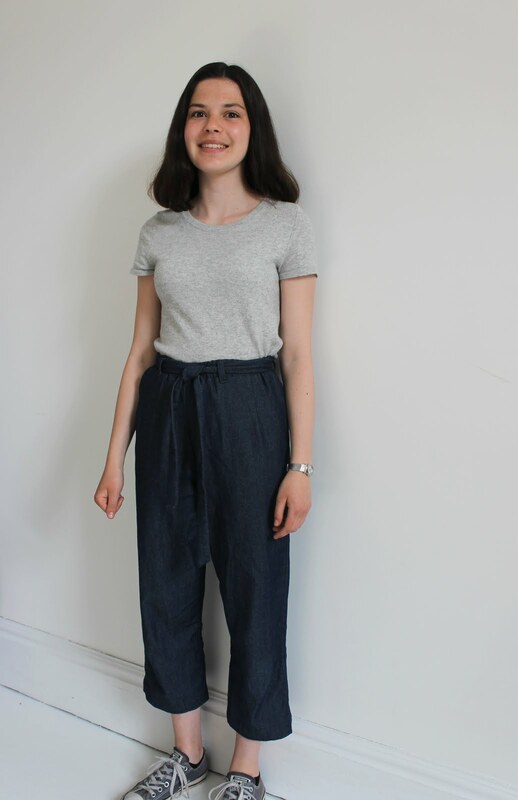 I've wanted a pair of wide-legged trousers ages, so I'm so pleased to have finally made some! These were definitely worth the wait too as I absolutely love them and finished them in perfect time for the start of spring. They are made out of a really lovely light-weight Robert Kaufman denim which I bought greatly discounted at the John Lewis post-Christmas sale. The fabric is truly wonderful quality, and such a nice colour too. The weight of it means that it's perfect for spring weather trousers and will probably work nicely in the warmer months too. I've done lots of pattern hacks before but never for trousers, and I was initially worried about where to start. I was nervous to cut out the fabric as I didn't really know how wide to make them or at which point I should start adding the width. My original plan was to make them much wider, like culottes, but I as you can see I didn't cut the fabric anywhere near wide enough. In the end, I just tried them on and tacked them to several different widths until I found one that I like and which worked with the amount of fabric that I had. I'm actually really happy with the end result, I think it makes them really versatile, and while I know for next time what to change in order to make them wider I want to make lots more pairs exactly the same as these! The pattern that I based these off was the Tilly and the Buttons Marigold trousers. I've made the Marigold twice before I did make quite a few adjustments to these trousers so having past experience of the pattern definitely helped when making these. 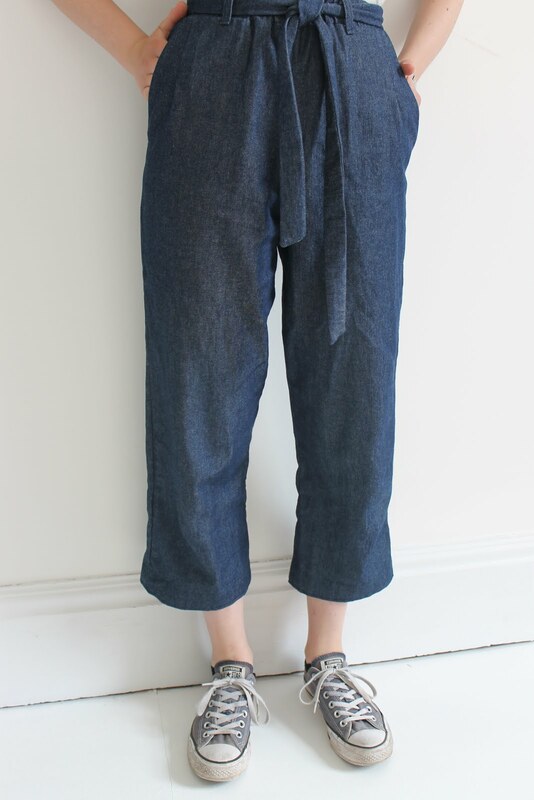 In my first pair, I found that the waistband was really high, and when I made a pair for my sister I shortened the crotch seam to lower the waistband. I did exactly the same thing on this pair: I shortened the crotch by 1" on all four trouser leg pieces where the lengthen/shorten line is make on the pattern. I'm really pleased to have made this adjustment as these fit really well. The waistband rests on my natural waistline rather than a few inches above it like my other pair. Apart from widening the legs, the only other adjustment I made was to add the tie at the waist. I have a really nice pair of black ready to wear trousers like these which were gifted to me by a friend so that I could inspect how they were made, and one of the things I love about them (and lots of other trousers that I've seen around) is that they have a tie at the waist. It was a really simple thing to do, all I did was measure how long and wide I wanted the tie to be and then sew two pieces of fabric right sides together in a super long rectangle. I also sewed each end at an angle, an extra touch that I think looks nice. As for the belt loops, I simple used the same instructions and pattern piece as on my Ginger Jeans and they work perfectly. The tie not only adds a lovely extra touch (I think it's my favourite part about the whole trousers!) but it also covers up the elastic at the front around the waist, something that I'm not keen on when tucking tops in. Another thing that I like about the tie is that it makes a pair of otherwise quite plain trousers into something much more interesting. The great thing about pattern hacks is that you get to keep all the best parts of a pattern while tweaking it to add other bits which are exactly to your taste. I really love the pleats and darts of the Marigold and find that they make the trousers fit really nicely. I also love the deep pockets - both practical and add a nice design feature. Overall, this was definitely one of those projects that I wasn't sure about while I was making it (Would the proportions be right? Would they fit?) but now that I've made them I LOVE them! I have worn them so much already and will definitely continue to do so. It turns out that a pair of comfortable, versatile and look-great trousers was something that I was missing for Spring and I cannot wait to make lots more pairs in the future! These look fab. So stylish looking and I bet they are super comfy too! This is such a great pattern. I love how your pants turned out. They look great on you. I love them! They look like 1968 brushed off and made cool again. These are fabulous trousers Anna, you're so very talented! I'm so pleased to find your blog! Re-reading old copies of Suzy magazine, I saw your feature and was SO impressed at your sewing at just 15 years old. I must say, you also have one very lucky sister! I am happily reading your blog, and I had to leave you a comment of encouragement, because it makes me happy to see young people sewing. And you've inspired a couple of makes for me too!